Meso-scale wind data are based on the WRF weather model. The WRF model includes the non-linear physics of the atmosphere. Running a weather model can be a quite tricky computational task. Computers can run WRF on parallel machines, to achieve results extremely quickly, but with simplified physics. Or, WRF can include the best physics, but with the draw-back to need longer. At SANDER + PARTNER we let you choose whether you need ultra-fast / reduced physics or slower results / best data quality. SANDER + PARTNER has added unique features. We provide 30+ year wind data. Therewith we follow the recommendations given from the World Meteorological Organisation and from national met-offices whenever climatological variables shall be considered - exactly what is required by the wind industry. We are the only company able to provide true 10-minutes mean values. 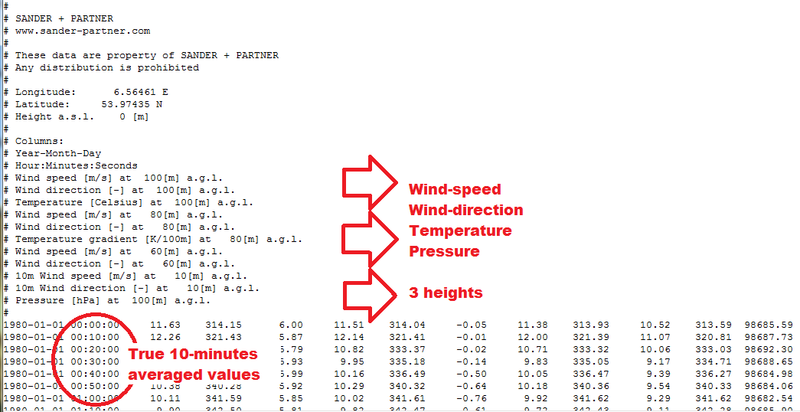 Therefore our meso-scale wind data are closest to how real measurements are recorded. Based on 15-seconds wind spots, we average the data and provide true 10-minutes mean values. Banks prefer using 30+ years wind data. And wind data analysts like true 10-minutes averaged meso-scale wind data. LOGIN and get access to the best meso-scale wind data available on the market.